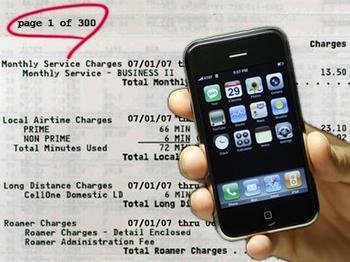 Woman Incurs $37,000 iPhone Bill While on Vacation - iPhone.MY - Daily News On Mac, iPhone, iPads, iPods and more! If you are curious how to go about international travel with your beloved iPhone, then our blog is a pretty handy resource thanks to Sebastien and his many trips overseas. Just make sure you don’t take any advice from Alanna Fero of British Columbia. The Canadian woman went on vacation to Egypt with her brand new TELUS iPhone, only to return home to a cell phone bill that would make Brad Pitt say WTF? For her 2 weeks on the African continent, Mrs. Fero racked up a $37,000 phone bill due to international roaming while using her iPhone. How in the world could this happen might you ask? Your cell phone plan, in general, is built for nationwide travel. Unless you have specific international dialing and data usage features on your plan, per minute voice calls and per MB data usage gets extremely expensive outside of your home country. But don’t worry. In most cases this can be avoided by simply contacting your wireless provider and letting them know where you are traveling to. They’ll help you determine which international calling plan and features are right for you. Now I say in most cases because that’s precisely what Alanna from B.C. is claiming she did. She says she was sure to contact her wireless provider, TELUS, several times before she left the country to ensure she didn’t come home to a ridiculous phone bill. Sounds like it’s a serious case of he said she said, but due to the public nature of this situation, you can bet that TELUS will negotiate that $40,000 bill down quite a bit. An easier option is to turn OFF Data Roaming and Cellular Data in Settings > General > Network. What do you guys think? Have you or are you planning to travel abroad with your iPhone? Sound off below.